This page describes an obsolete hacking tool that should not be used for new hacks/projects or with new disassemblies/tools. This page (and associated files) is being kept for historical purposes only, as it documents and archives the history of the Sonic scene. 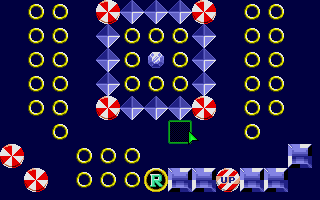 Sonic 1 Maze-o-matic (or Maze Editor) is a DOS-based program created by Cyan Helkaraxe, for editing special stage layouts in Sonic 1 savestates. Create a save state file with Gens or Genecyst -> Put the save state and the program into the same directory -> Pull the save state file onto MAZE.EXE and drop it -> You should see the program opened just fine. This page was last edited on 15 April 2018, at 13:55.